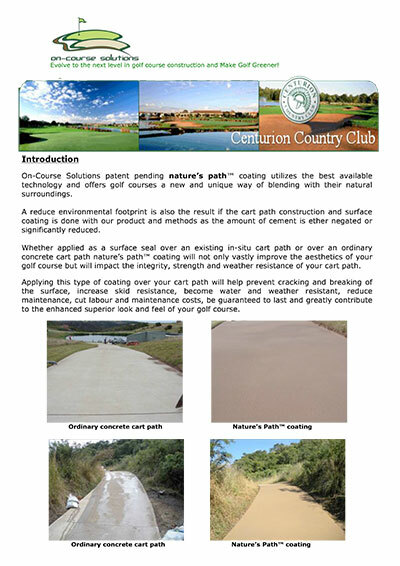 On-Course Solutions patent pending Nature’s Path™ coating for Golf Cart Paths, utilizes the advanced technology and offers Golf courses a new and unique way of blending in with their natural surroundings. 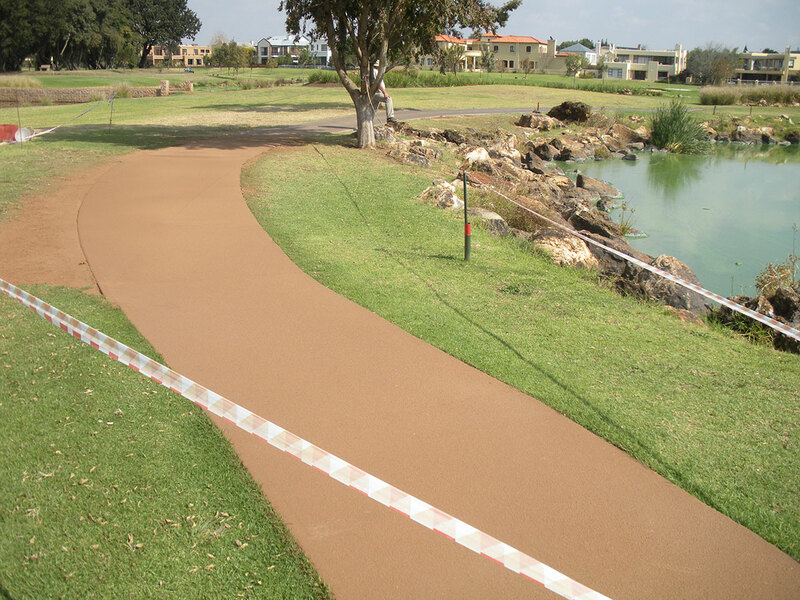 A Reduced Environmental Footprint is also the result if the cart path and surface coating is done with our unique product and application method. 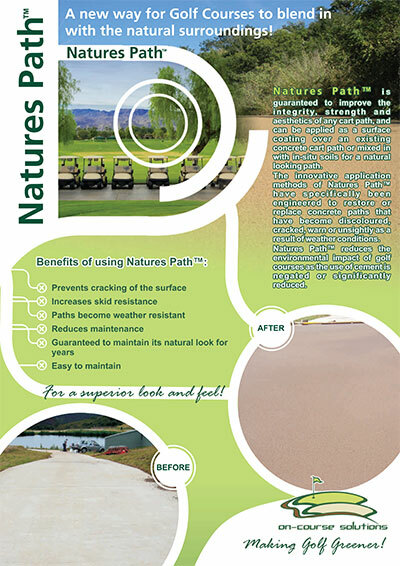 Whether applied as a surface coating over an existing ordinary concrete cart path or applied on an in-situ constructed cart path Nature’s Path™ will not only vastly improve the aesthetics of your golf course but will improve the integrity, strength and weather resistance of your cart path. As some cart paths will have a dual role of cart path and golf maintenance vehicle path what is the durability of the path when using the stabilizer? If properly constructed, sealed and maintained, as we will describe, the durability should be indefinite. Will the cart path hold up to significant rainfall even though longitudinal grades of the cart path paths will vary from flat to 14% and most cart paths will be constructed where the natural ground slopes from one side of the cart path to the other side? That is fine, as long as there is adequate cambering of the surface allowing free flowing drainage. 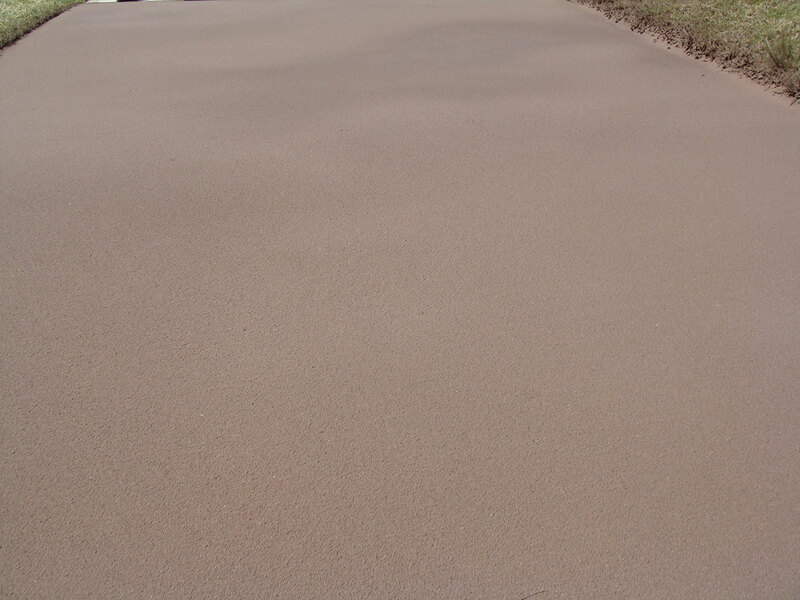 The stabilizer is water resistant however as with any pavement structure water should not pond on the surface. Does the type of soil we have available affect the quality of the cart path when using the stabilizer? We would need to conduct complete soil indicator testing such as Grading, classification, Atterberg Limits, UCS, ITS and Densities etc the same as when layer works of a road are designed and constructed. How thick of a layer will be constructed when using the stabilizer to build the cart path? This depends on the quality of the sub-grade material which is usually determined by geotechnical surveys and centerline investigation which will also tell us what soil indicators are present and whether or not mechanical modification with borrow material is required. In most cases we can achieve good strength on the sub-grade with a small percentage of cement and good compaction, provided that the sub-grade is not sitting on top of shifting clay soil layers, which will be difficult to deal with in any situation. Once that is done build the wearing course of 150mm. What application rates per square metre would be recommended? The application rates will be determined from the final soil indicators as mentioned above followed by a testing matrix to determine the best mix design in terms of durability and tensile strength as well as economics. We would look at the indicators and draw a lab testing matrix for your lab to conduct and base our final mix on the results. This is also standard practice for pavement design, and in terms of the laboratory a fairly simple and cost effective exercise. Does the untreated soil characteristics, such as particle grading and Atterberg Limits, change the application rates and performance / durability of the stabilized soil mixture? Yes, absolutely, grading is the key, poorly graded material will require mechanical modification with borrow material and failing the availability of suitable material the chemical stabilization requirements increase. Is any pretreatment of sub grade improvement required where low CBR materials are encountered in the sub grade? Yes, as mentioned above we cannot just build a pavement on any material, it would be like placing glass on a mattress. If the sub-grade is well compacted, for instance with an impact roller a fairly good strength can be achieved. Does the stabilized soil have tensile and compressive strength? If so please provide an estimate of the various strength criteria. That would depend on the indicator results and the final test results of the mix design. It is not unusual to achieve (UCS) strength of 2.7 MPA at 98% Mod AASHTO density and (ITS) of 270-310 KPA at 98% Mod AASHTO density. Have there been construction techniques developed to enable the limits of the cart path to be defined as a clear edge? 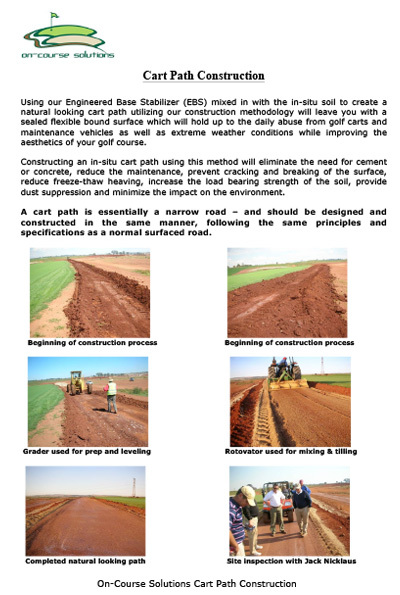 Our recommended method of construction is to use a Reclaimer/Recylcer/Milling Machine to mix the stabilizer and soil together in a homogenous mixture creating the 150mm layer and then using a grader to create the final levels and shaping followed by compaction. Once this layer has been constructed properly and the stabilizer given the required curing time a surface seal using the stabilizer is applied over the layer as a final seal. 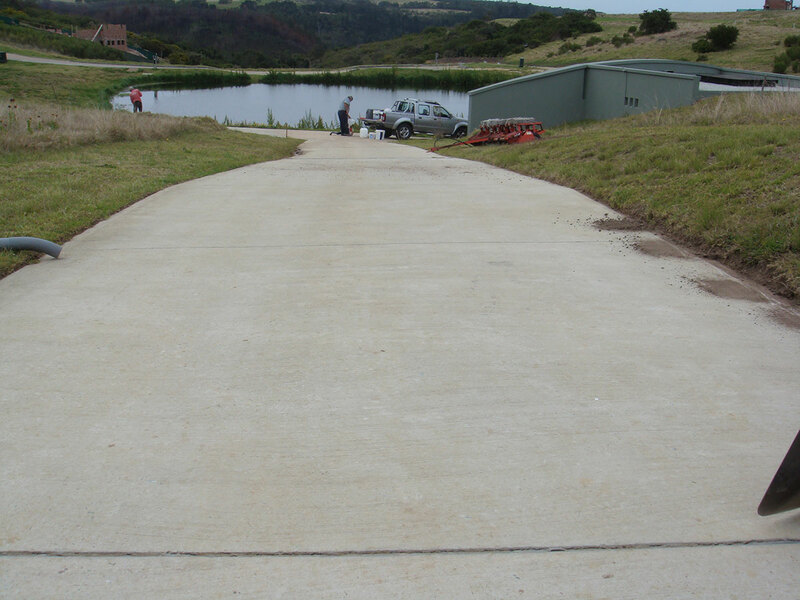 Upon completion of this the grassing can be done and during the hydro seeding of the edges the clear edge would be naturally defined as the seed will not germinate and root on in situ soil that is compacted to 98% Mod AASHTO. In the absence of a Reclaimer a tractor pulled rotovator and a box blade may be used followed by a water tanker for the mixing of the copolymer and soil and finished as above. To what density does the stabilized soil mixture have to be compacted to achieve a durable performance? Standard road building specification which is 95% Mod AASHTO for the sub-grade and 98% Mod AASHTO for the wearing course. Is the product safe to use if it will be used in areas adjacent to environmentally sensitive lands and vegetation? The product is completely environmentally friendly, safe for animals, wildlife and vegetation and dries clear and transparent, leaving the environment in its natural state. MSDS and Aquatic Toxicity Reports are available upon request. What are the surface skid / slip characteristic for pedestrians and carts / maintenance equipment when surface is wet on grades up to 14%? 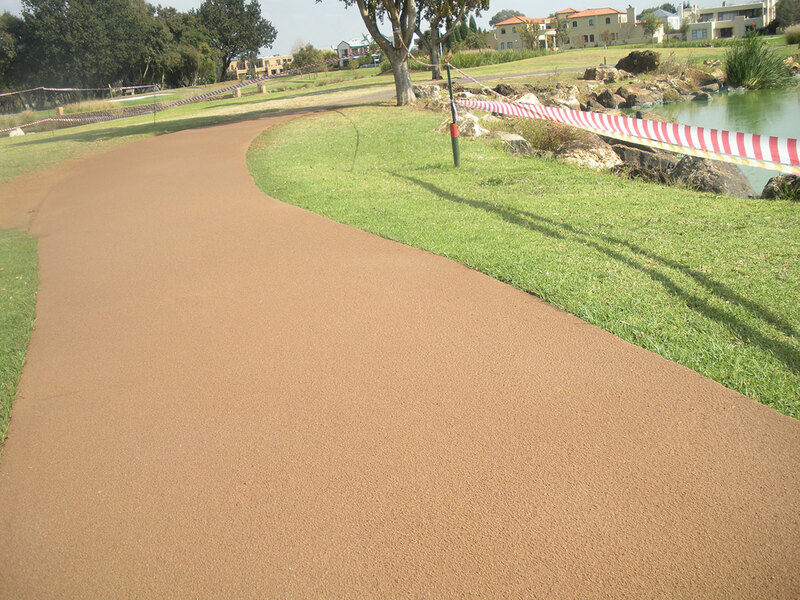 Since the wearing course in being constructed with the soil stabilizer on in situ material and sealed with the same, the natural coarse qualities of the native soil will create excellent skid resistance while minimizing rolling resistance. The same applies if the surface is wet, it will not be slippery. Is there any performance guarantee when using the stabilizer to construct the cart path? We can provide a guarantee to the extent that the product will perform according to the laboratory test results and final mix design provided that the construction is done to specification. Can you provide an estimated cost for the construction of a cart path? We cannot provide a definitive cost estimate until we have reviewed the soil indicator tests and have some idea of the mix design as well review of the current design of the cart path inclusive of cross sections, cut to fill layers etc. which will enable us to provide a more accurate survey of quantities. Will the stabilized cart path degrade or lose strength? The stabilizer will not degrade or lose strength once cured it becomes a solid mass. When used for cart paths will deterioration occur spasmodically resulting in pot holes occurring in the cart paths? No, pot holes are a result of either poor drainage, ingress of water into the underlying layer or the occurrence of differential settlement or a combination of all the above. The stabilized layer will not have this if it is well compacted, sealed and maintained. 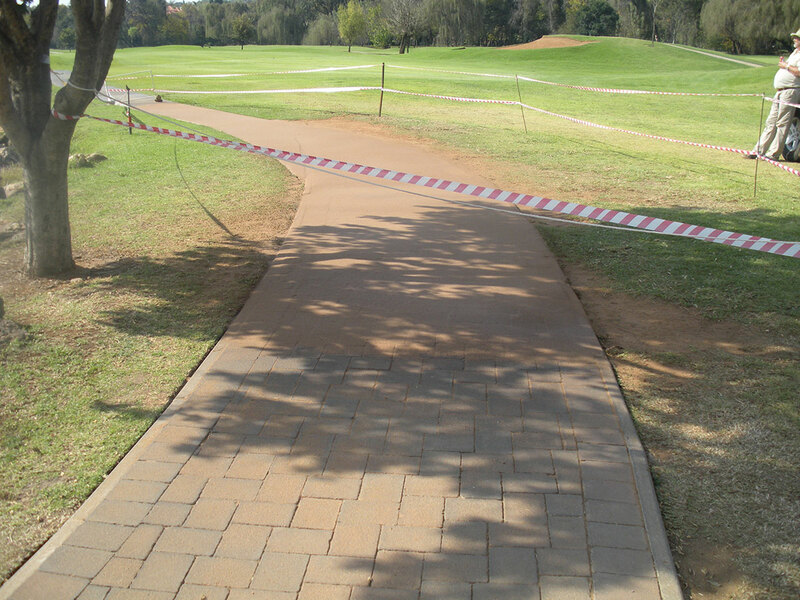 Can the stabilized cart path be patched successfully without deterioration of the surface? Yes, repair to any damaged area is similar to any road surface with the added benefit that the water based emulsion (stabilizer) will naturally coalesce with the pavement structure around it. Are soil samples required before final determination of application rates? Yes samples are required and tests by an accredited civil engineering materials testing facility? 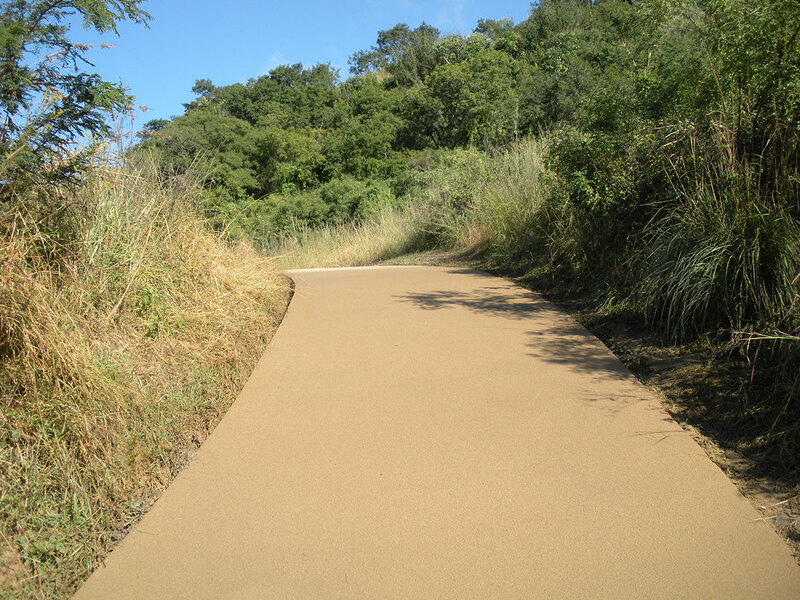 While Nature’s Path Coating provides a totally new and unique solution for upgrades on existing Golf cart paths, as well as an effective method of protecting golf cart paths and extending their life while improving aesthetics…. 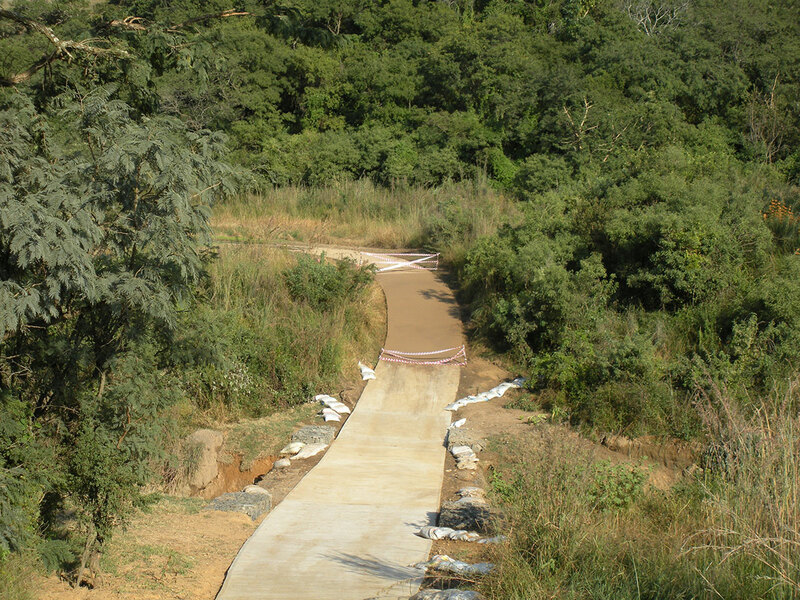 On-Course Solutions is also able to construct Golf cart paths using a soil stabilizer with in-situ soil which will negate or significantly reduce the need for cement or imported aggregate which will result in decreased costs as well as a decreased environmental footprint. 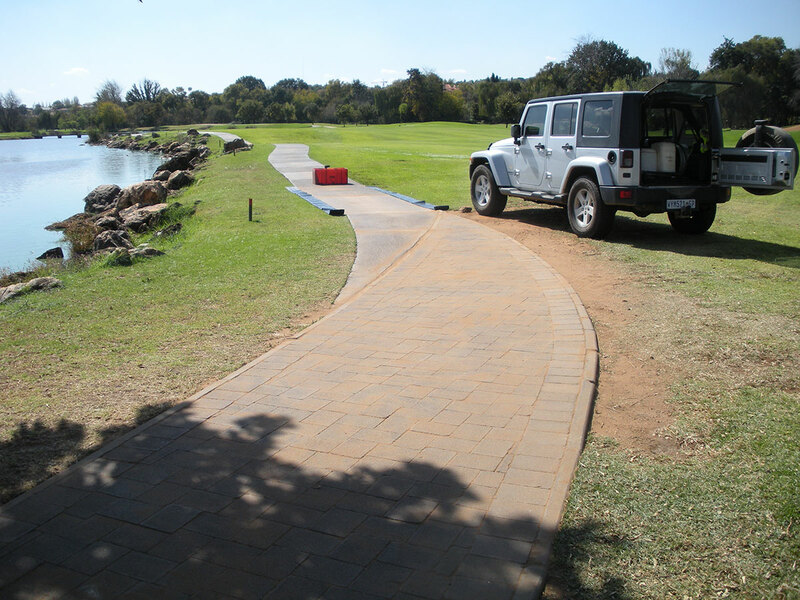 Golf cart paths are essentially narrow roads – and should be designed and constructed in the same manner, following the same principles and specifications as a normal surfaced road.